Definition at line 22 of file LibraryInfo.h. Constructor. Combines all the information required to identify a library. This constructor allows the user to define everything. Definition at line 39 of file LibraryInfo.h. Referenced by getMultiLibraryInfo(), and getUnknownLibraryInfo(). WARNING: DEPRECATED. Doesn't work with the partitioner. Constructor. Combines all the information required to identify a library. 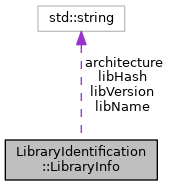 This constructor constructs the hash, and all other library info, from a SgAsmGenericFile. Unfortunately, the name and version of the library is only availible from dynamic libraries, so it must be passed in here. WARNING: Currently Elf files only! WARNING: DEPRECATED. Doesn't work with the partitioner. Constructor. Only takes the hash, Rest to be filled in from matching in the database. Definition at line 90 of file LibraryInfo.h. Constructs and returns the special sentinal "Unknown Library" instance for functions that couldn't be identified. Definition at line 110 of file LibraryInfo.h. Definition at line 123 of file LibraryInfo.h. Definition at line 134 of file LibraryInfo.h. Definition at line 98 of file LibraryInfo.h.